Apple crumble is the perfect food. You dont have to use precise measurements, you can vary the ingedients to make it healthier/more nutritious/less calorific or whatever. And it is the most comforting thing you can put it in a bowl. You can reaheat it in the microwave it if there’s some left over. On cold mornings it is great for breakfast. Peel the apples, cut into pieces and put it an ovenproof dish. A small dish will make a denser crumble, a large dish a crisper result. Sprinkle with the cinnamon. If you want the apples to turn into applesauce, sprinkle with a little water. Put the nuts and seeds in a blender and pulse until they are chopped. Add the rest of the ingredients and pulse until crumbly. If the butter is very cold and stubborn, chop it into pieces with a knife and blend again. Spread the crumble mix over the apple. If there are bits of apple left uncovered they will caramalise in the oven. Bake at 175 degrees C for 45 – 60 minutes. If the top starts getting too dark, put some foil over it. Serve hot, warm or cold with milk, yoghurt, cream or ice cream (dairy or substitute). 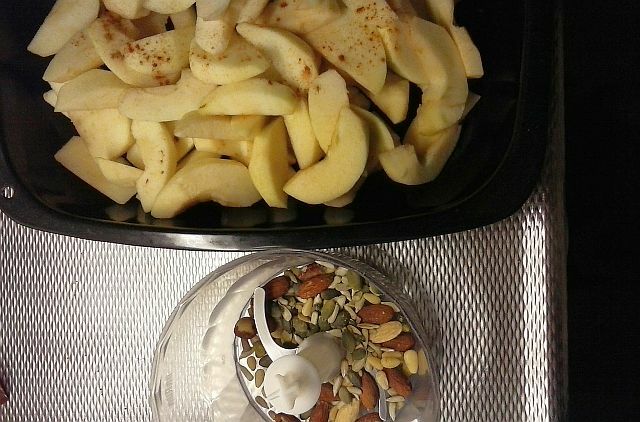 * If you are in a rush, microwave the apples for a few minutes to precook them, add the topping and bake for 30 minutes. 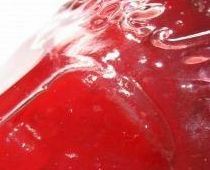 ** If you are in even more of a rush, use a bag of frozen fruits of the forest instead of apples, mixed with 2 tbsps of sugar.